We started this forum as a service to the disenfranchised members of the Greg Lake Forum when it was closed down. Greg’s forum is now open again, but we still have lots of fun on ours and would welcome new members, so please invite anyone you think would like to participate. The more, the merrier! Our new forum has many great features including private messages, events calendar, and a chat room. We’ve set up a few boards but welcome your suggestions and feedback for more. Please enjoy the forum! You will need to register with a valid e-mail address, as your account validation link will be e-mailed to that address. We encourage many points of view; however, no “bashing” of Greg Lake or his fans will be allowed. Be sure to read the forum rules when you sign up. For tips and tricks, please see the Help link at the top of every forum page. Photo Caption Contest – We have a winner! We held a photo caption contest exclusively for forum members and David “Smackiepipe” Barrett submitted the winning caption (above). 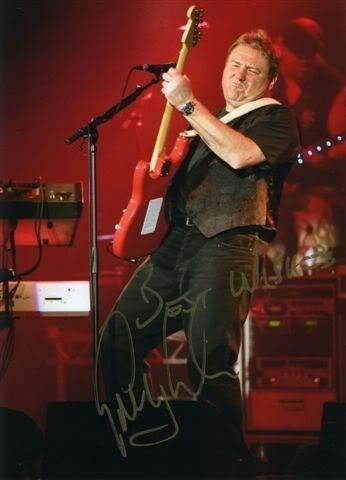 He won this hand-autographed photo of Greg on the 2005 UK tour, graciously donated by Lee Millward. We plan on having more contests in the future, so be sure to join our Discussion Forum for all this and great conversation, too.